The accommodation is on two storeys, with bedroom and bathroom on the ground floor, and living kitchen area on the first floor with french doors to private garden. 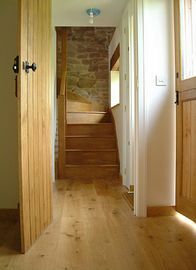 The cottage has recently been beautifully renovated, with character beams and stonework typical of the Herefordshire area. 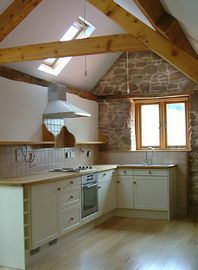 The accommodation now features oak flooring throughout and a brand new kitchen and bathroom. The location of the Bothy provides an ideal position from which to explore the many attractions the area has to offer, countryside and town alike. Cities such as Hereford, Cheltenham, Bath and Gloucester are within reach. Also the fantastic countryside of the Royal Forest of Dean, the Malvern Hills, Symonds Yat, the Wye Valley, Brecon Beacons and the Cotswolds. Just down the road in Ross on Wye there are many activities such as canoeing, walking, cycling, fishing and golf. New kitchen, bathroom and cloakroom. Local Services: Set in the rural countryside 3 miles north of the bustling Ross on Wye where there are ample shopping facilities. Plenty of leisure activites such as fishing, golf canoeing and walking. 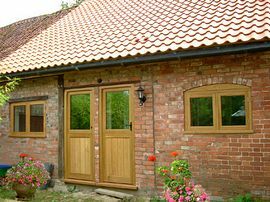 The Bothy is situated in a private lane off the B4221, near Phocle Green. Take the lane and the property is set next to the Coach House the first property on the right. Prices from £300.00 low season and £350.00 high season.